rob mclennan's blog: 12 or 20 (second series) questions: with Susana Gardner. 12 or 20 (second series) questions: with Susana Gardner. 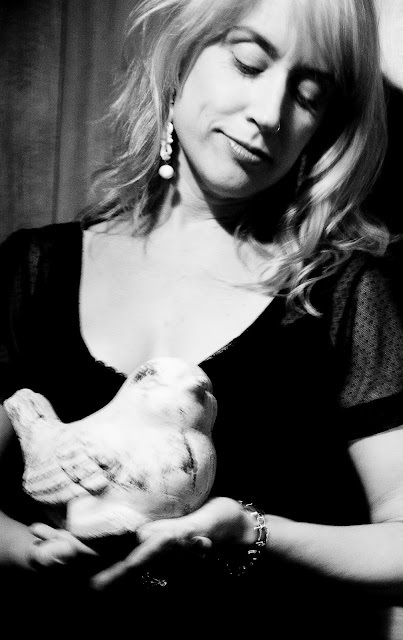 Susana Gardner is the author of the full-length poetry collections HERSO (Black Radish Books, 2011) and [ LAPSED INSEL WEARY ] (The Tangent Press, 2008). Her third book, Cuntstruck Lithe Guttersnipes is forthcoming from Xexoxial Editions. She has published several chapbooks, including Hyper-Phantasie Constructs (Dusie Kollektiv, 2010) and Herso (University of Theory and Memorabilia Press, 2009). Her poetry has appeared in many online and print publications including Jacket, How2, Puerto Del Sol, and Cambridge Literary Review among others. Her work has also been featured in several anthologies, including 131.839 slög með bilum (131,839 keystrokes with spaces) (Ntamo, Finland, 2007) and NOT FOR MOTHERS ONLY: CONTEMPORARY POEMS ON CHILD-GETTING AND CHILD-REARING (Fence Books, United States, 2007). She lives in Zürich, Switzerland, where she also edits and curates the online poetics journal and experimental kollektiv press, Dusie. I’ve made hand-crafted small chapbooks of poems and poetic objects for as long as I can remember. Having my chaps come out in 2006 under the auspice of indy presses gave me something tangible to present to the world, in larger editions, thus making my work available to a wider audience. My first paperback book came out in 2008 and as many writers experience since it was, for the most part finished years before, in some ways it felt surreal and anti-climactic. Of course receiving a box full of my own books was a rush, and having a proper book to bring to readings felt huge. I am very grateful that the editors took a chance with me as well. But mainly, I felt like I had finally finished that earlier project, so with a satisfied feeling of completion, I knew I could finally move on to other work which is a cathartic feeling only publishing the work itself can achieve. I would like to say I came to poetry, but really it came to me. It was always there. In nursery rhymes, and books available through school or the public library. For me, poetry is the ultimate expressive writing form. Poetry breaks down barriers and rules that other forms seem to need to adhere to and also spins itself out more easily and quickly for me than fiction or non-fiction. It is more economic as well.That said I do enjoy epic works and long poems but I really enjoy the freedom that only poetry has, in my case, been able to satiate. It really just depends. I go through different spells of output. When the writing does come it initially does come quickly. I spend a lot of time with it after the initial draft. I don’t have the time to spend 10 hour days writing poetry on walls or sitting at the computer anymore, but I don’t sleep much so I try to use the time I do have as effectively as I can. And basically, I try to write it out when it comes. I have written down poems during meetings and other functions where I should be focusing on something else. For me it is difficult to ignore the harkening muse. When it does not come, I must remind myself to surround myself with even more poetry. Reading is essential to the process, it provides a conversation with my community and literary heirs/heritage...enables the process to continue onward. The ‘book’ seems to happen all at once, especially since my first book was published. I tend to envision the idea first, sometimes even the title. But there is no set rule or design in how it comes about. I am open to each project being its own from the start, I usually feel in debt, or determined by the project, that it is some stronger or greater thing than myself. I tend to write longer poems, but so far each project or book is self contained. I sometimes say that we are constantly writing and rewriting the same book. I believe that, of course the books end up being different but are all coming from the same creative place, culling or zeitgeist. I would not want to be weighted down with an ongoing epic work, though I can certainly appreciate the impulse and dedication in others. I really enjoy reading, whatever kind of venue that might be. I feel like this is the ultimate establishment of the poetic experience, as well as the poem and work. Performance also leads me to revise—sometimes during the performance itself. I often imagine the performance during the creation of the poem. I record all of my work and practice the sound of it before any given reading, so there is always the element of potential performance involved. To this point, I have not limited myself to any one particular theory per se and I do not want to limit myself. I want my poetics to continue to grow, and ‘be’ multiple. The writer should be the ‘voice’ of the people, or ‘a voice of the people’, in whatever form that takes. I think the current role of writers and artists in contemporary society should be given higher value. The arts would grow enormously with more support and funding and appreciation of the larger culture. Imagine if the arts were as highly valued as say reality tv? That would pummel our society into all sorts of positive fantastic directions. Well, as an editor myself, I find the process to be essential and with the right editor it can be very valuable. There is no such thing as writer’s block. Carolyn Forche used to always say this. If you need a prescription (or assignment) get it, as there are many strategies to overcome the feeling of being blocked. For me, it is often revising other works. There is no typical day, but having deadlines certainly helps. This was a huge initiating factor behind beginning the Dusie Kollektiv, making deadlines and creating new projects to which I must adhere to the deadlines. Of course working with huge groups of people is not easy but creating like this in a mass context is truly invigorating. This said, I do not sleep much. I tend to write in the middle of the night. I don’t really have that problem, more often it is carving out the time itself. But, in the case where I feel stagnant or feel like I need inspiration I often try to work on unfinished work or give myself an assignment. I also do collage work when I need another outlet or poetic perspective, this can get the engines running again as well. There are many forms which influence my work, definitely visual art, but also relationships, especially my somewhat still new experience with motherhood over the last 8 years, but certainly books as well. I also draw inspiration from the environment of my girlhood, the sea. There are so many and the span of which is fairly broad. I love turn of the century (last) writing, whether that be late Victorian, early modernist fiction and poetry. I can live in those novels and have spent a lot of time doing so in way of reading and dreaming! If I could seamlessly swap trades right now without worry about training or money, perhaps a jeweler or artisian in general. I am not sure what other career I may have pursued, perhaps anthropology or library science. That said I do not earn a living with this occupation. Being a poet is a self-appointed position, and sadly, has never been my bread-job. I’ve just always written, and it came a lot easier than anything else. All you need is paper and a pencil or pen versus other arts which are supply dependent. Have recently finished reading, Water Babies: A Fairy Tale for a Land Baby by Charles Kingsley, in nightly installments to my daughter. What an incredible book! It really is amazing how many books are out there, that we know of even, which we haven’t read but when we do feel like they speak to us on a deeper, more powerful level. I am also constantly reading contemporary poetry as well. I am also constantly re-reading what I love, almost in a prescriptive way. Frank O’Hara’s Meditations in an Emergency, Lisa Robertson’s The Men, Mina Loy’s The Lost Lunar Baedeker. There are so many others who I go to as well, whom I visit and re-visit, HD, Keats, Dickinson, Whitman. I feel the energy of my poetic lineage strongly, it is always there. I am always in conversation with them, the work, it is not something which is buried, ever. I am presently reading Matthew Henriksen’s Ordinary Sun (Black Ocean, 2011) and really enjoying it and taking my time with it as I feel its greatness already. Joe Ross’ Wordlick (Green Integer) is also another great book I have read in the last few months. Also, saw an amazing reading in Prague this year by British poet Holly Pester and really cannot wait to read her work! I must say, I feel very fortunate to be an editor. I have been lucky enough to publish many many fantastic poets, I also feel in conversation with their work as well. Dusie has several new books forthcoming from the following fabulous poets, Danielle Pafunda, Jenn McCreary, Elizabeth Treadwell, Vincent Zompa and Hassen Saker. I don’t watch tv or too many movies, but the last interesting movie I saw was perfect sense with Eva Green and Ewen MacGregor. My third book, Cuntstruck Lithe Guttersnipes will be published with Xexoxial Editions in the fall, 2012. I have also begun a new manuscript. I was hoping to write a novel this year as well, and am still hoping that might pan out!